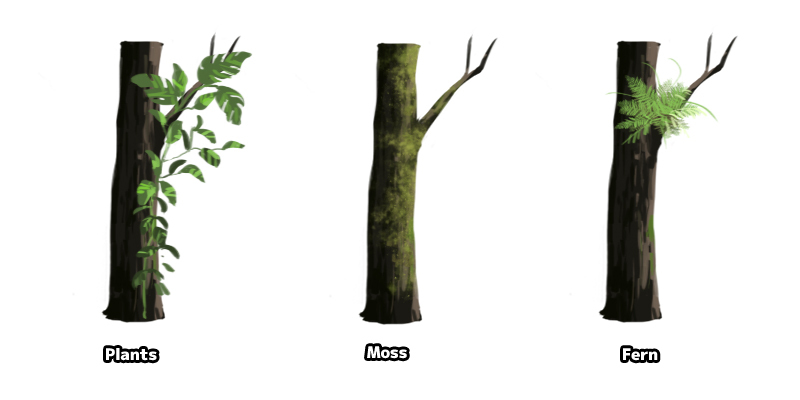 This quick tutorial will show the steps on how to paint tree trunk, bark and branches. 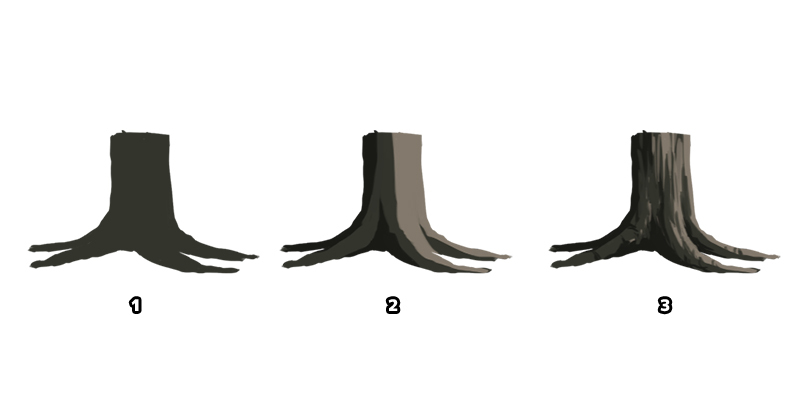 Tree trunk and branches define the silhouette and shape of trees. Sometime it is a good idea to draw them first before painting the leaves, so we would know how our trees will look like. 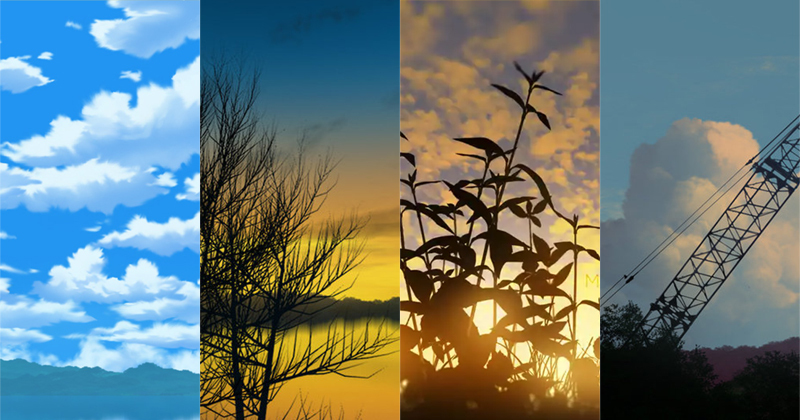 Image above show different shapes of trees. 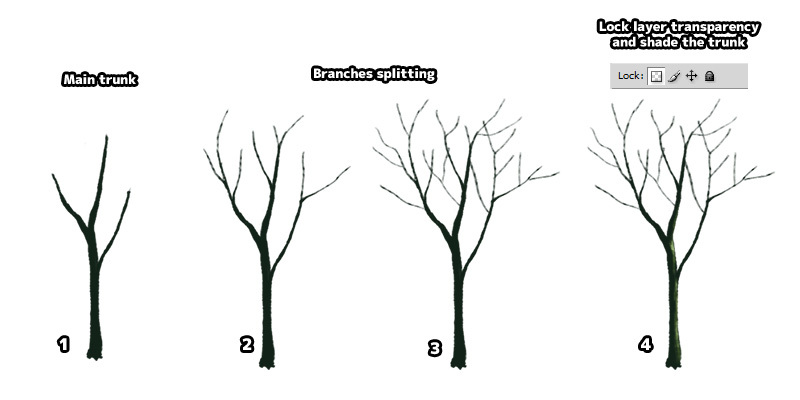 For painting, we can further simplify the painting by reducing number of branches splitting. 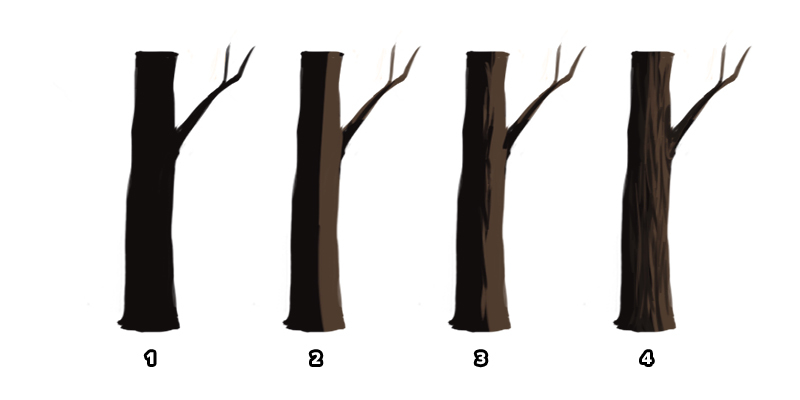 Scale down brush size and draw smaller branches. Split the branches into another level. Lock layer transparency and start shading the tree branches with a brighther shade of colour. Tree branch can be seen as a fractal pattern. 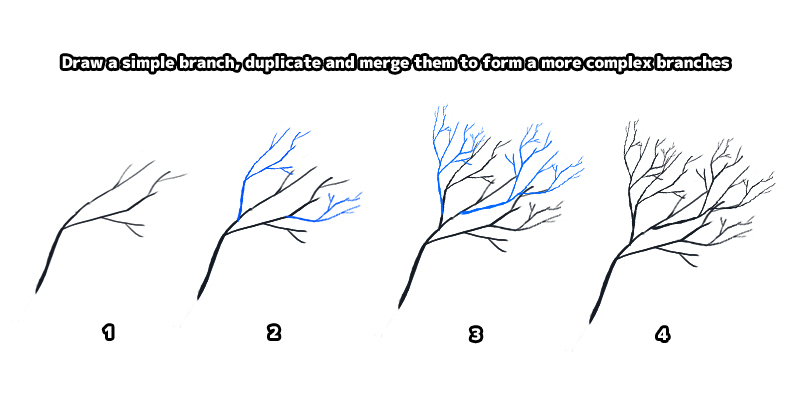 Another quick way to draw tree branch is to draw a simple shape, then duplicate and merge them to form a complex branch. Repeat the steps to form a bigger tree branch. Draw tree branch with a hard edge brush. Duplicate the layer then scale transform (CTRL-T) it and merge them. When painting tree trunk and branches, we are mainly painting cylinder shapes with rough and irregular surface. Draw the contour of tree trunk/branches with a hard edge brush. Lock layer transparency and paint the bright area of the tree. Area between the light and dark area is known as terminator. Paint the shadow terminator area with vertical shapes to mimic tree bark pattern. Continue to paint different area of the tree with different shades of colour. Pay attention to light and dark area of the tree. 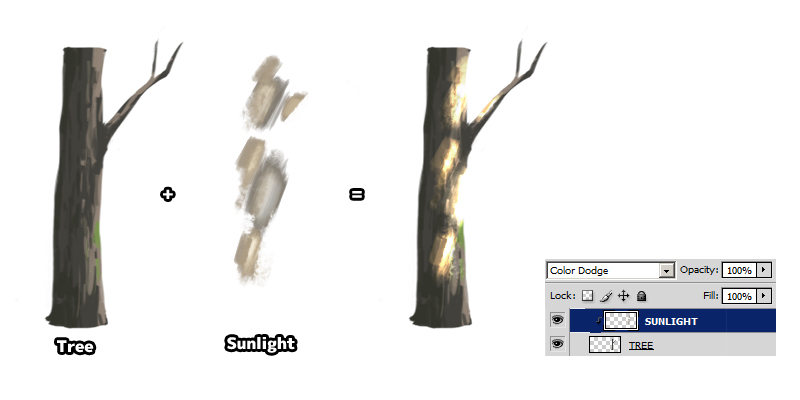 Lock layer transparency, then paint the light and dark area of the tree. 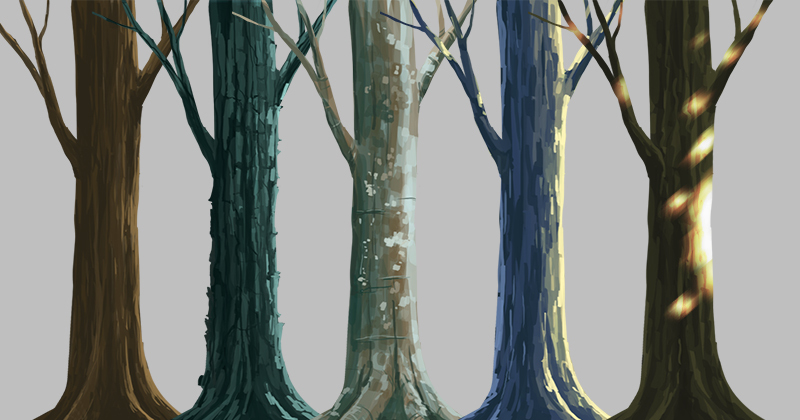 Paint vertical shapes to mimic tree bark pattern. As we can see from the two examples above, the important steps on painting tree trunk and branches are determining the light and dark area. Then, adding in the smaller details of tree barks. 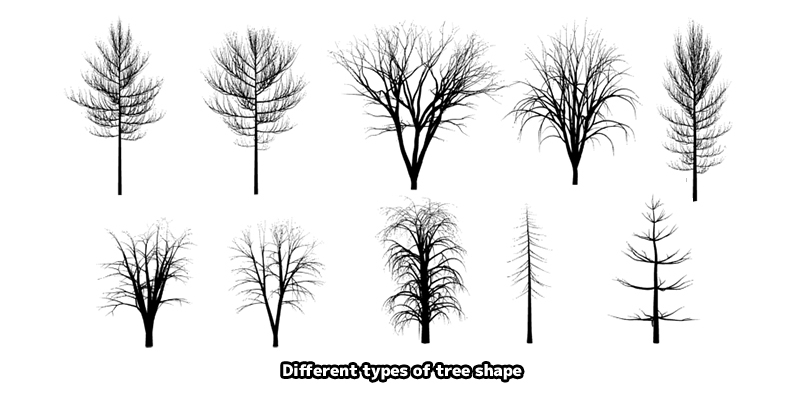 There are many types of trees in nature. Birch tree have white colour bark, while other trees such as rainbow eucalyptus can have colourful tree bark. 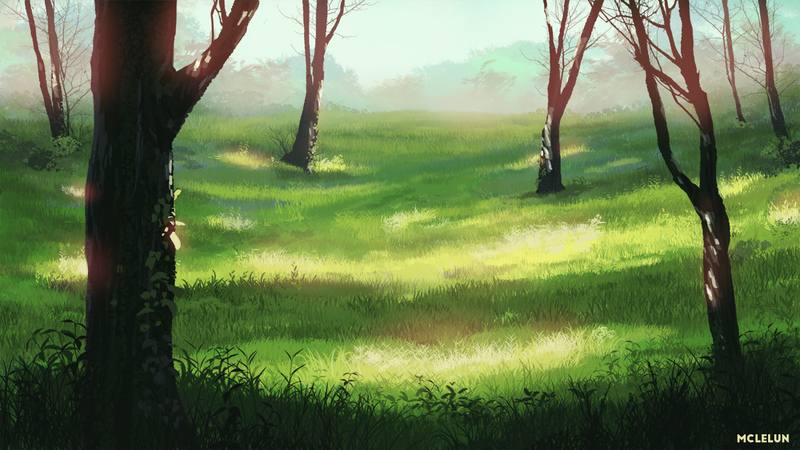 If we are painting an anime style landscape art, feel free to use a more vibrance colour palette for the trees. 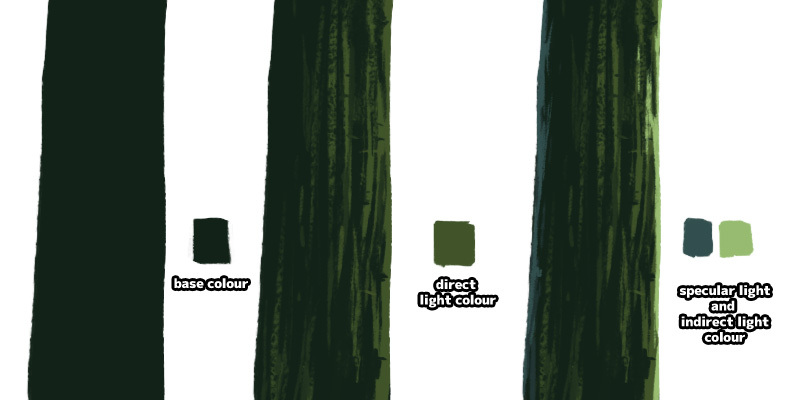 A quick way to add more colours to tree is by painting the area which receive direct (or specular) and indirect light. 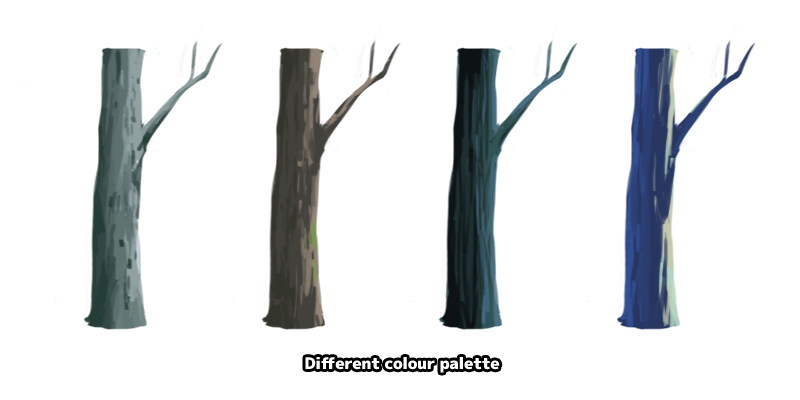 There are two more common tree shading we can apply into our painting. 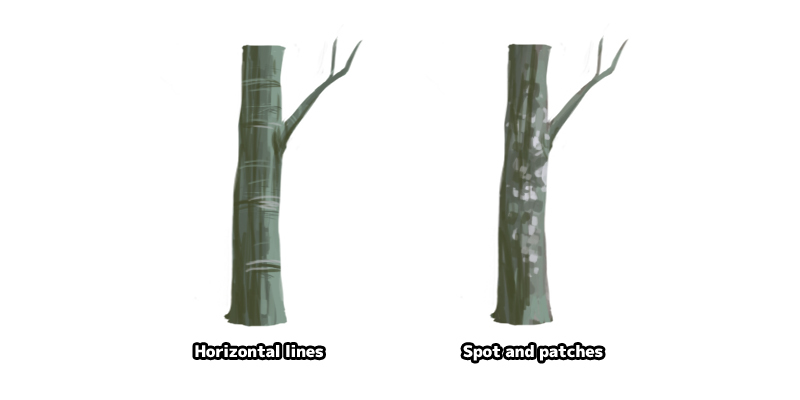 Alot of trees with smoother bark will have these horizontal lines on them. Some trees also will have patches and spot on the trunk. Aside from the main tree trunk, we can add in extra details for the tree. Climbing plants like Pothus or vine, moss and fern are some examples. To add sunlight that fall on tree trunk. We just need to paint on another layer with additive blend mode such as Colour Dodge. Add a new layer using clipping mask. Set layer blending mode to Colour Dodge. Below is a tree bark painting timelapse video using Photoshop. To learn more about painting tree leaves, read my anime tree painting tutorial. Thank you so much for all these tutorials! This is really helpful!! !